There are different ways in which you can get into the Safe Mode in Windows. They depend on the version of Windows you are using. Which Safe Mode option should you choose? 1) On the Windows Start Screen/Menu, type Advanced. 2) Click on Advanced startup options. 3) Under the Advanced Startup heading at the bottom of the General Settings screen, click on Restart now. 4) Your computer will restart and you will be taken to the Advanced Startup Options menu. To easily reach this menu, on Windows start screen, you could choose restart while holding the Shift key. 5) Click on Troubleshoot and then on the Advanced Options button. 6) Now, click on Startup Settings. 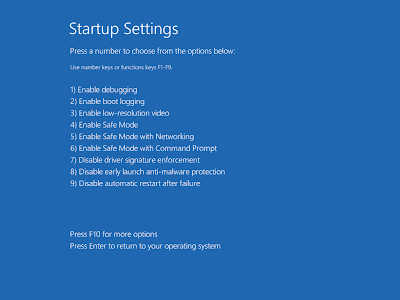 7) At the Startup Settings Screen, click on Restart. 8) Your computer will restart to Advanced Boot options from where you can choose a Safe mode option based on your need. You can also force Windows to start in Safe mode. 1) Select Advanced Repair Options and then click on Troubleshoot. 2) Click on the Advanced Options button. 3) Now click on Startup Settings. 4) At the Startup Settings Screen, click on Restart. 5) Your computer will restart to Advance Boot Options from where you can choose a Safe mode option based on your need. If you are using these versions of Windows, you can try the following methods. 1) Restart your computer if it is on. 2) Right before the system starts to boot, start tapping the F8 key continuously. 3) This should load the Windows Advanced Options boot menu. 4) Select a Safe Mode option based on your need using the arrow keys and press Enter. 5) Windows will start in Safe mode. To get out of Safe mode, simply restart your computer. This method should work on Windows 7, Windows Vista, Windows XP, Windows 2003 and Windows ME. However, if it does not, you can always force Windows to boot in Safe Mode if your computer is working "properly". If the F8 key method does not take you to the Advanced options boot menu, you could try turning your computer off when it boots into Windows. Upon next restart, Windows will notice that the computer did not boot successfully and take you to the Advanced Options boot menu. Then, select a Safe mode option based on your need. This method is risky and should only be tried as a last resort. It could result in some of your files being deleted which could make your Windows installation unusable. Most users looking to boot Windows in safe mode will have a computer that is not working properly. Unfortunately, this method will not help them as it requires the user to have a working computer. 1) Press Windows key+R to load the Run dialog box. 2) Type msconfig and press Enter. 3) This will start the System Configuration Utility. 4) On Windows 10, Windows 8, Windows 7 and Windows Vista, go to the Boot tab and tick Safe Boot. On Windows XP, go to the BOOT.INI tab and tick /SAFEBOOT. 6) Click on Restart in the following dialog box to boot into Safe Mode. 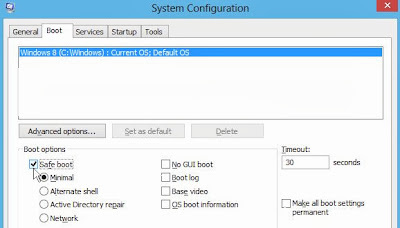 7) To start your computer normally, untick the Safe Boot option in the System Configuration Utility. Your computer will restart in Safe mode. Different Safe Mode Options. Which to choose? These are the various safe mode options available in Windows. You can choose one based on the features you require. This is safe mode in its most basic form without any extra features. It is useful for troubleshooting most common problems . This offers additional support of connecting to the internet or any other network. This is useful when your PC has a problem which might require you to frequently use the internet to troubleshoot. This option will allow you to use all the unique features of the Windows command prompt while in Safe mode.